June 29, 2009- Right around 09:30 Pottsville City Fire was dispatched to 500 East Market Street, Pottsville City, on a possbile house fire. As city units were going responding they were advised of a second call back, stating that there was smoke visible coming from the house. Incident command P-6, arrived on scene and upgraded the box to a working house fire, and asked for the Schuylkill Haven RIT to be dispatched to the scene. So at 09:38 the RIT was sent to assist Pottsville with Chief 723, Engine 737 and Squad 739 responding with 11 members. However, once everyone from Haven arrived on scene the bulk of the fire had already been knocked down and units were already performing overhaul operations. So only after about 15 minutes of being on location everyone from Schuylkill Haven Boro was placed clear and available. June 26, 2009- As stations 1 & 4 were at the previous motor vehicle accident, station 2 was dispatched to the area of 700 Garfield Ave, Schuylkill Haven Boro, for a tree down. When engine 732 arrived on scene, they found a small tree down across the roadway. The crew from the engine quicly removed it from the road and were cleared in about 5 minutes. June 26, 2009- At 10:26 the Rainbow Hose was dispatched for Rescue 727 to assist District 34 (Summit Station and Friedensburg) on an industrial accident at 959 South Route 183. As the rescue was going responding, they were cancelled off by District 34 Incident Command as it was a garden tractor accident and the rescue was not needed. Time out was 5 minutes. June 19, 2009- At 14:38 stations 1 & 2 were dispatched to the area of 1544 Route 61, North Manheim Twp, to assist District 41 (Cressona) on motor vehicle accident with injuries. As units arrived on scene, they were met with a 4 car MVA with minor injuries and fluids down on the roadway. Rescue 727 and Engine 733 got to the scene and assisted with putting floor dry down and packaging patients to the awaiting ALS truck. The 2 stations from Haven were on scene for about 45 minutes before being released back into the borough. 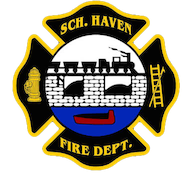 June 17, 2009- At 23:54 all 3 Schuylkill Haven stations were dispatched to the area of East Market and South Margaretta Steets, Schuylkill Haven Boro, for a transformer fire. Upon arriving on location, Duty chief 720 (Peel) advised that the transformer exploded causing a fire near the top of the utility pole. Rescue 727, Engine 737 and Engine 732 responded to the call and assisted with blocking the roadway until the Schuylkill Haven electric crew arrived on scene to make repairs. Units were kept busy for just under an hour. June 11, 2009- At 22:54 all 3 stations were dispatched yet again to the intersection of Schuylkill Mountain Road and Spotts Lane for a tree down on the roadway. As Chief 723 (Donatti) arrived on scene, he advised county that one engine would be able to take care of the call. Engine 737 arrived on scene, and the rest of the units were marked available. Time out was 20 minutes. June 11, 2009- At 07:16 stations 1, 2 and 4 were dispatched to the area of 300 Berne Drive, South Manheim Twp. for a tree down. Chief 720 went repsonding and had all units hold in station until he arrived on scene. After a brief search, Chief Peel cancelled all units as there was no tree found.